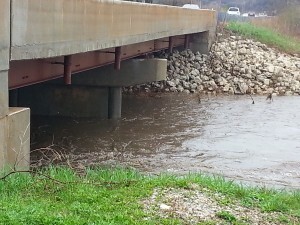 I shared some photos of near-flooding on the Rock River in Moline on Tuesday. At the time, flood levels were supposed to come close to official flood level, but then subsided. After two days of heavy, heavy rain, river levels have risen dramatically. Many area hydrographs show similar data to the ones below, rising from well under flood stage to what is classified as “major” flood levels. Sure, technically the Rock River isn’t above flood stage right now at its measuring station in Moline, Illinois, but it’s been close enough for long enough this spring. Fun fact: six of this location’s ten highest recorded floods have occurred in the past 20 years, and the top 12 floods at this location all have happened since 1970 (also, fourteen of the top twenty, by my rough count). I stopped by Harold’s Landing on my lunch hour and took a few pictures. My wife got me into Big Wreck when we first started dating, and I’ve enjoyed their first two albums, as well as debut album from frontman Ian Thornley’s band, Thornley. I just started listening to Big Wreck’s most recent album, Albatross, and it is my favorite of the bunch. The gap between the better tracks and the rest of the album has closed with each album I have heard (I do not have Thornley’s second album Tiny Pictures… yet). 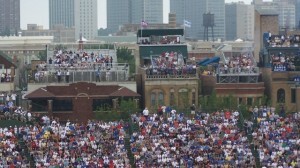 The Wrigley Rooftops. Photo courtesy of Wikipedia. The Chicago Cubs should leave Wrigley Field. It is something I never thought I would say, much less believe. I remember my first Cubs game as a kid in the midsummer of 1986. Growing up more than an hour from the ballpark, I spent summer afternoons watching them on Channel 9. I was so used to how it looked on TV, that I was surprised just how small it looked; I actually asked my cousin if “this was their practice field.” I still remember Manny Trillo running the bases after hitting the ninth-inning home run that beat the New York Mets 4-2.